Brekky is a bit local, organic and yum this morning! Mix flour and baking powder in large bowl, add eggs and a splash of milk. Whisk and keep adding milk until you have a thick batter. Add lemon juice, blueberries and nectarines and stir through. Heat about 2 Tbsp oil and a knob of butter in large frying pan. Drop large spoonfuls of batter into pan. Flip when they are lightly browning around the edges. Repeat until batch is completed. Drain on paper towel. Serve with chunky apricot jam, yogurt and/or maple syrup (Cheeky Organics). Here we have a few locally foraged figs on the side. You could substitute any summer fruits in this recipe. In winter I used sliced apple and pear. 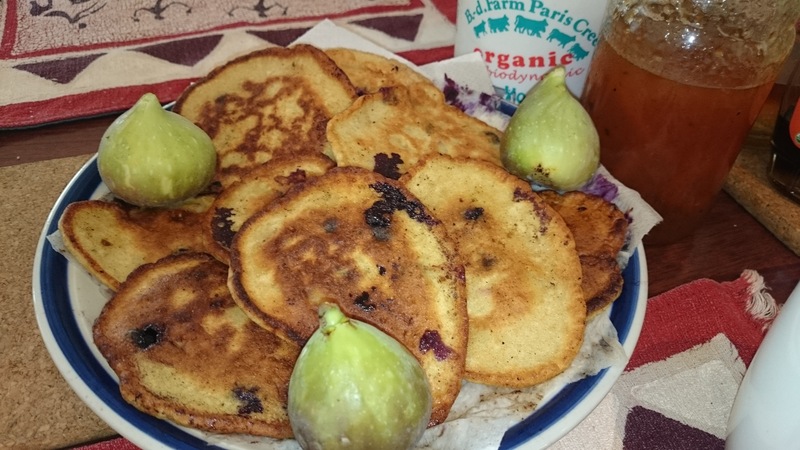 This entry was posted in Food, fruit, Local food, recipes. Bookmark the permalink.